No ordinary Leisuredrive this. 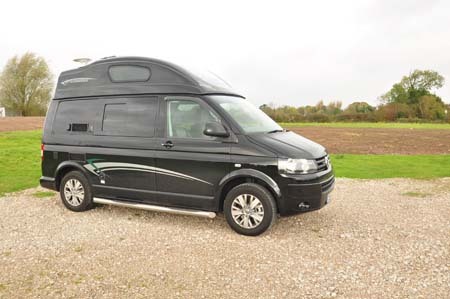 It’s the Vivante in Hi-Line trim, but topped off as a 20th anniversary special edition model from 2014 – which makes 2015 a celebratory coming of age for this model, but from a staunchly independent company that’s not far off hitting the half-century for continuous VW camper production. It’s the 102PS (100bhp) engine with five-speed manual gearbox that comes as standard in this Vivante – it’s a considerable step up in performance from the too-basic 82bhp starting point from rival converters. There are upgrades, of course – 138bhp and 178bhp engines, six-speed manual or seven-speed DSG semi-automatic transmission, even all-wheel drive. Arguably, what’s more important is the conversion you’re getting. Here, there’s no arguing with a formidable list of standard specification. There is scope to add even more, as you wish – just ask Leisuredrive direct – especially as there’s still plenty of payload here. This variant takes the basic £41,990 price for a Vivante up to £44,990. But, it all seems justified and it still seems very keenly priced versus a whole host of rivals. You get a bit of choice with the layout, too. It’s certainly not your standard VW camper here. 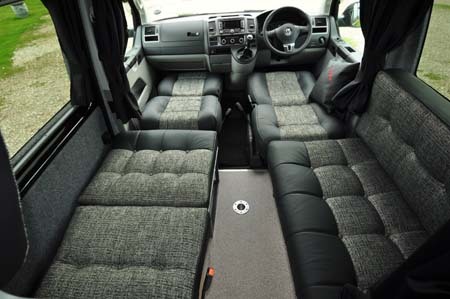 Instead, there’s a lounge arrangement of offside settee and nearside travel seat, as here (Individual Type Approval means Leisuredrive can get away with the lap restraint on the settee). Or, surely preferable if you intend on carrying two passengers in the back, you can have two forward-facing rear seats. Whichever you go for, there’s the assurance that comes with knowing everything has been tested independently. On the downside, the beefed-up framework in the seat bases does tend to restrict storage. 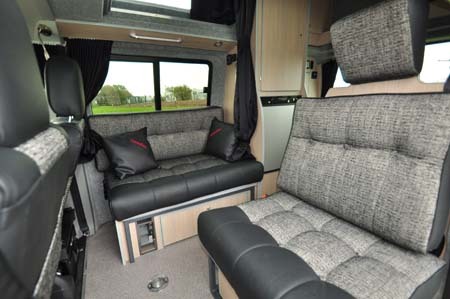 The floorplan also allows you to create an even longer settee once you’re on site – thanks to an extra fitting that allows the driver’s seat to push fully forward and recline flat, measuring 2.00m x 0.65m. That’s also the basis for the twin single beds, which can go on to offer you a double, but admittedly it’s starting to get a bit fiddly. 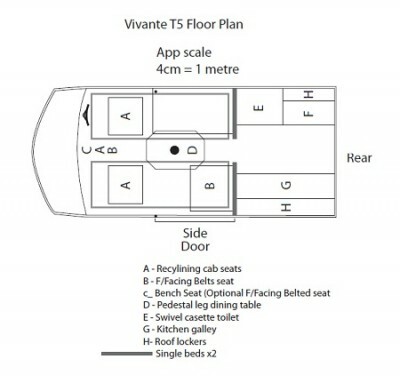 Above, slide-out boards allow you to make berths three and four, although arguably these are best for children, especially bearing in mind access. You get thick, black-out curtains all round, plus a generous mix of LED lighting, as part of the conversion package, also a good level of insulation including carpet wall lining as well as recycled plastic in the panels. Plus, you benefit from two heaters – there’s a mains-operated blower as well as an Eberspacher unit operating from the base vehicle’s fuel system. There’s also a Propex water heater, housed in the rear nearside seat base. 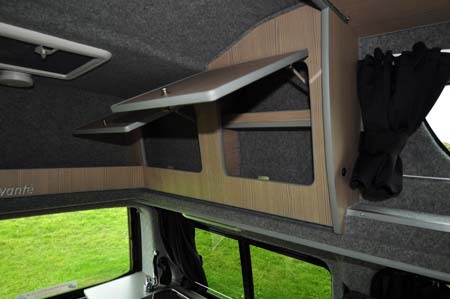 And, because it’s a high-top overhead, there’s not just permanent headroom but also all-important extra storage. 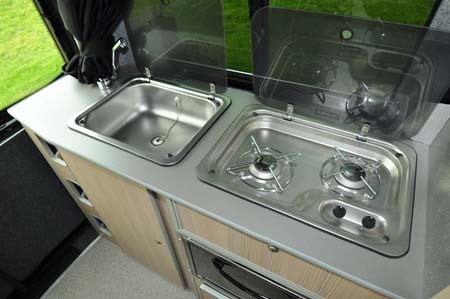 Towards the back, the main kitchen area is along the nearside, where you get a Dometic two-ring hob and separate sink, with a separate grill. 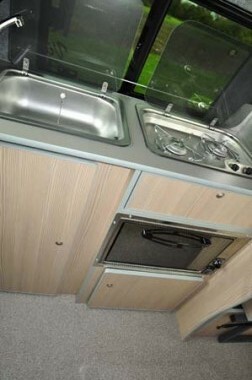 Across the galley is a Dometic RM5310 60-litre, three-way fridge, set at a convenient height. 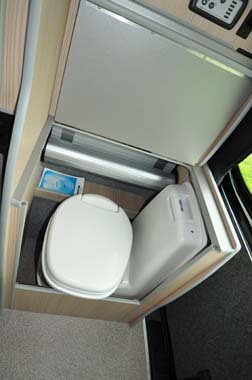 One of the Vivante’s other big selling pints is its plumbed-in toilet. You can create a privacy area for using the toilet, but which could also act as a small changing room, with the wardrobe handily adjacent. It’s all pretty clever, and you could be forgiven for not realising this is still the short-wheelbase T5. That all-black exterior might be a bit of a shock, but there are the usual VW colour alternatives. With sales also handled by a network of some ten agents around the country, Leisuredrive can also point to a better distribution than most other VW camper manufacturers. Not forgetting, of course, there’s a degree of flexibility in build and specification. 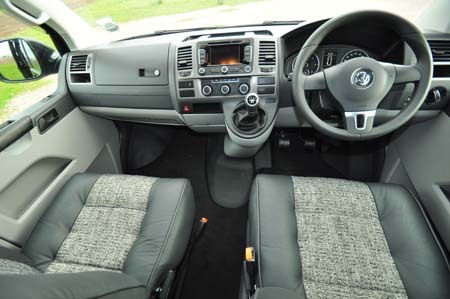 There’s more information on the Vivante on the Leisuredrive website and to find out more about our low-cost premiums visit the motorhome insurance discounts page. What about the Devon Sundowner? It’s a great looking VW Tim. There’s more information on the Devon Sundowner here if anyone’s interested in taking a look.